This wraparound ring highlights the sparkling, inner beauty of an amethyst geode. This ring from designer Karina Harris reveals the inner beauty of its materials. 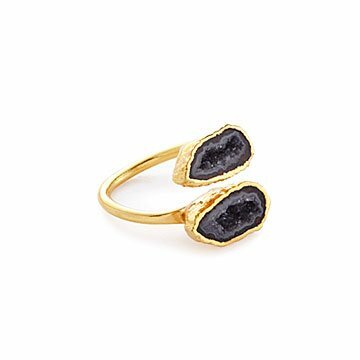 On its own, a geode looks like an ordinary stone, but Harris splits it open to reveal the rings of sparkling amethyst crystals within. She sets the two halves in an adjustable wraparound coil, made from copper and then plated in 24k gold. The striking setting allows the gem's natural brilliance to shine, and it can do the same for anyone who wears it. Each geode has its own unique shape and coloring, making it a one-of-a-kind creation. Handmade in San Francisco, California.